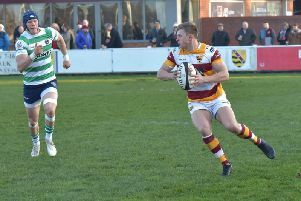 Last weekend’s outstanding victory at Chester may have come at a cost in terms of injuries, but Fylde RFC’s head coach Warren Spragg remains happy with the options available to him for a “very exciting” month ahead. Three of Fylde’s four December fixtures are at the Woodlands, starting with Wharfedale’s visit tomorrow and culminating in the home derby against Preston Grasshoppers three days before Christmas. 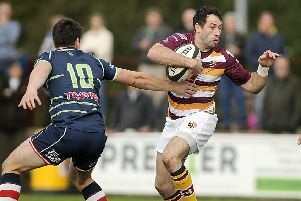 The 16-7 victory at second-placed Chester was Fylde’s third in a row and lifted them to fifth in National Two North, though it came at a price. Having already lost experience centre Chris Briers to a knee injury sustained in the final training session before Saturday’s visit to Hare Lane, winger Henry Hadfield suffered a hamstring injury during the game, Sam Dugdale split an ear and key back-rower Dave Fairbrother damaged a shoulder. Briers is again doubtful for the visit of Wharfedale, a game the other three will definitely sit out, with the influential Fairbrother’s injury the most serious. Spragg told The Gazette: “Fairy could be out for quite a while but we can’t be sure how long yet. Henry won’t play for a week or two and Sam is unavailable. “But Ben O’Ryan and Harlan Corrie are ready to start, and we have Adam Joyner and Jacob Conner fit and available, so we are more than happy with the options we have. Another player unavailable to face Wharfedale is scrum-half Gus Warr, who started at Chester. The dual-registered Sale Sharks half-back will spend the weekend at Loughborough University on a training camp with England’s Under-20s. That will mean a recall for Cameron Crampton and Spragg explained the situation with his number nines. He said: “We talked to both lads before the season. When Gus is available he will get some game-time but Cam is by no means the weak link. There’s nothing between them and they are both good lads. Spragg hesitated to describe the win at Chester as his most pleasing as head coach but he is clearly delighted at the momentum his squad is building going into a critical month. He added: “In terms of the league it probably was our best result in that Chester had not lost at home for a year. “Their try came directly from our mistake and they went the length of the field. “Otherwise they scored no points and I was really impressed with our defence. But these lads are in great shape and should take pride in their ability to defend, which they did last weekend. “Yes, we’d have liked to have scored more than one try ourselves, though we had a lot of pressure and did have chances. Tomorrow’s North Yorkshire visitors are five points behind Fylde in eighth after back to back defeats.